Start on the left tree to kill zed more efficiently and reduce danger on missions. Level Research What does it do? Start on the center tree for more options in your fort buildings. 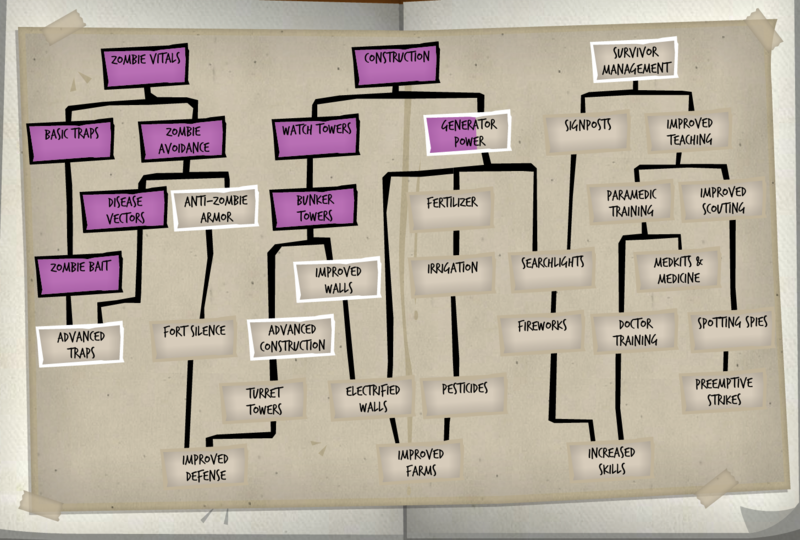 Start on the rightmost tree for management skills that make your survivors stronger. The think you REALLY REALLY REALLY should explain is happyness system. How do church and bars work? What are those “+0.01 per day” made of? Does an active mission of bartend or preach make any difference? Please, Sarah, please please please! I cant understand the happyness system, please give some advice, or some tutorial, rigth now i cant find any effect of building bars, or putting leaders in there it just seem random, but i almost sure i just dont get it. My name is Stephen. I have two questions. First, is probably the most popular question you have gotten, whether you’re creating another sequel in the Rebuild Series. The second is a tech or research tree for each individual. Like, would it be possible to have a randomized skill tree to develop for each person inside the fort? I mean it would be based and developed off of skill level and experience, but it would add so much more uniqueness to the game in general. Is this a possibility?